(Nanowerk News) Researchers at Rensselaer Polytechnic Institute have discovered a new, more precise method for measuring how much — or how little – nanoscale interfaces love water. The investigations, led by Shekhar Garde, the Elaine and Jack S. Parker Professor at Rensselaer and head of the Department of Chemical and Biological Engineering, were detailed in a series of three recent journal articles. This new method for measuring hydrophobicity could have important applications for the future of drug discovery, Garde said. Researchers at Rensselaerhave discovered a new, more precise method for measuring the hydrophobicity of nanoscale interfaces, which could have could have important applications for the future of drug discovery. 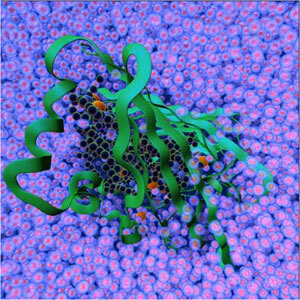 The above snapshot from a molecular dynamics simulation shows a protein (center) embedded in water. “It’s easy to measure hydrophobicity at the macroscale — you just put a drop of water on a surface and watch with your own eyes to see what it does,” Garde said. Water beads up on hydrophobic surfaces, such as a lotus leaf or nonstick frying pan, and spreads on hydrophilic surfaces. Hydrophobicity is measured by the angle with which the droplet of water contacts the surface. The three papers were published in Physical Review Letters, Proceedings of the National Academy of Sciences, and as the cover story of this month’s issue of the American Chemical Society journal Langmuir. Garde’s group performed extensive molecular simulations modeling nanoscale interfaces called self-assembled monolayers. They modeled a range of hydrophobic and hydrophilic surfaces, and carefully monitored the behavior of water molecules interfacing with these surfaces. Contrary to the researchers’ expectations, the simulations showed that the density of water next to a surface is a poor gauge of the hydrophobicity of that surface. However, also unexpectedly, the researchers did find that there is an excellent correlation between hydrophobicity of the surface and fluctuations in the density of the adjacent water. The new method could lead to a more robust approach for characterizing the hydrophobicity of complex and heterogeneous surfaces of proteins, biomolecules, and other nanoparticles, Garde said. Such an approach is expected to have important implications on understanding how proteins interact with each other, and how they bind to targets. The new method could potentially significantly augment current computational approaches to screening and designing drugs to treat a range of diseases, Garde said. Most of Garde’s molecular simulations were performed at the Rensselaer Computational Center for Nanotechnology Innovations (CCNI). Co-authors of the three journal papers include chemical and biological engineering graduate student Sumanth N. Jamadagni, along with chemical and biological engineering doctoral students Sapna Sarupria and Rahul Godawat. Financial support for these projects was provided by the National Science Foundation and American Chemical Society Petroleum Research Fund. Additional computational support was provided by an IBM Shared University Research Award.